SUMMERTIME Customer Appreciation at Purple Essentials - we LOVE your skin, naturally! Make sure to LOVE your skin all summer long - we do! 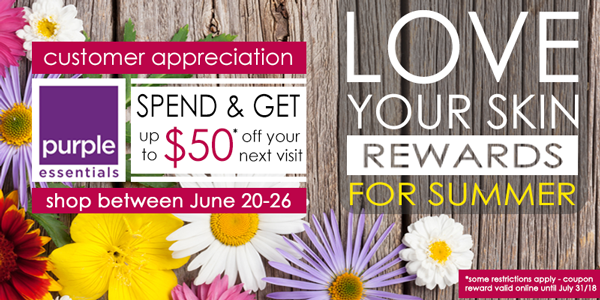 As a small thank you, we are happy to announce Love Your Skin Rewards For Summer. We don't think of it as a discount on our product, we consider it a reward for your loyal support. GET OUT - LIVE WELL! Shop online at purple-essentials.com before midnight P.S.T on June 26th - Spend $* in a single transaction - Receive a corresponding coupon code for your next online purchase ... it's that simple! *$'s is before taxes & shipping and net of any applicable discounts. Corresponding Coupon Code valid until July 31, 2018. Coupon Code will be delivered in a separate email following online transaction.